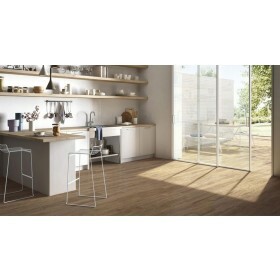 Vintagewood Dune is a light beige/cream porcelain wood effect tile suitable for use in any room of the house. As you run your hand over the tile there is a slight textured feel which helps with resistance under foot which makes these floor tiles an optimal choice for living rooms, conservatories, kitchens and bathrooms. Each piece of these tiles has a realistic wood grain effect and due to the technique of inkjet printing looks incredibly natural. 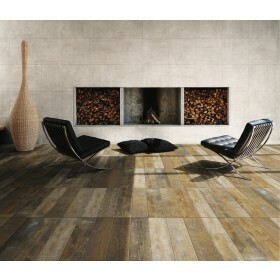 Wood effect tiles bring a warmth and character to a home in a similar way to real wood, but without the hefty price tag! These tiles do not need to be sealed and are simpler to maintain than real wood as they can be cleaned easily using a cloth and water and do not require varnishing/oiling as real wood does. They will not mark like real wood either and high heel marks that have always blighted real wooden floors are not an issue with these tiles. Vintagewood will suit more contemporary homes and traditional properties alike. Available in four other colours. Cinnamon (dark brown), Carbon (charcoal/black), Saddle (brown), and Ash (light brown). Yes this may be used with underfloor heating.